The goal of this case study is to compare the performance results of Avaliant Mercury to three known LDPC code standards, namely: 802.11ad, 802.16, and DVB-S2. The IEEE 802.11ad is the wireless standard protocol that was developed by the Wireless Gigabit Alliance (WiGig) to operate in the unlicensed 60 GHz frequency band. The 802.11ad standard can achieve a theoretical maximum data rate of 7 Gbps . The 802.11ad LDPC code rates include ½, 5/8, ¾, and 13/16 with a common block length of 672 bits. The 802.11ad LDPC codes are irregular. Appendix A shows the parity check matrix, H, for the various code rates. The published Bit Error Rate (BER) performance results for the 802.11ad LDPC codes with QPSK, 16QAM and 64QAM modulation are given in [2, Figure 5a]. Figure 1, Figure 2, Figure 3, and Figure 4 illustrate the 802.11ad LDPC BER performance for code rates of ½, 5/8, ¾, and 13/16, respectively, for the various modulation schemes. For the Avaliant Mercury, the number of iterations is set to 30 (Reference  used 30 iterations for the published results), and 500 block errors are accumulated. It is show that the Avaliant Mercury results match the published results for all modulation formats and coding rates. The BER curves using Avaliant Mercury were simulated down to 10-7 BER to detect the presence of error floor or lack thereof. The IEEE 802.16 is the wireless standard that is commercially known as Worldwide Interoperability for Microwave Access (WiMAX). WiMAX goal is to provide the “last mile” broadband access in metropolitan area network (MAN) . The 802.16 LDPC code rates include ½, 2/3 A, 2/3 B, ¾ A, ¾ B, and 5/6. The 802.16 LDPC codes are also irregular. Appendix B illustrates the 802.16 parity check matrix, H, for select code rates. The published BPSK performance results for the 802.16 can be found in [4, Figure 5.1 for BER and Figure 5.2 for Block Error Rate (BLER)]. Moreover, published performance results with QPSK and 16QAM modulation can be found in [5, Figure 3] for LDPC code rate of ½. Figure 5 and Figure 6 illustrate the BER and BLER performance with BPSK modulation for various LDPC code rates. For the Avaliant Mercury, the number of iteration is set to 30 consistent with , and 500 block errors are accumulated. It is show that the Avaliant Mercury results match the published results. Figure 7, on the other hand, illustrates the BER performance for 802.16 rate=1/2 LDPC code with QPSK and 16QAM modulation. For the Avaliant Mercury, the number of iteration is set to 100 consistent with , and 500 block errors are accumulated. It is show that the Avaliant Mercury results match the published results in . The DVB-S2  is a digital broadcast satellite transmission standard originally developed in 1993 by the DVB Project. DVB-S2 uses a powerful Forward Error Correcting (FEC) codes based on LDPC codes concatenated with BCH codes. The published QPSK performance results for the DVB-S2 can be found in [7, Figure A.4]. The DVB-S2 code rates investigated here include ½, 3/4, 5/6, and 9/10. For the results shown in , each LDPC frame is divided to multiple MPEG packets, 188 bytes each, and outer BCH code was also employed. Figure 8 shows the Packet Error Rate (PER) performance of various code rates with QPSK modulation for the normal frame of 64800 bits. 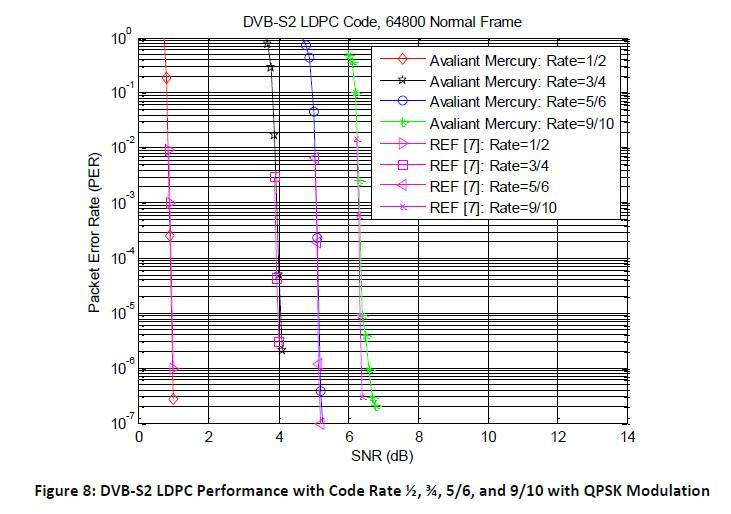 Note the Avaliant Mercury performance results only include the LDPC code without the outer BCH code, assuming 50 iterations. As a result, the Avaliant Mercury performance results show a tail at low PER because the outer BCH code was not employed. The outer BCH code helps clean up additional errors at the output of the LDPC decoder and will improve the overall performance, mainly reducing an error floor that shows up at low error rate . Otherwise, the results show good match. C. Zhang et al; "Performance analysis on the OFDM PHY of IEEE 802. 11ad standard," in proc. International Conference on Computational Problem-Solving, pp. 708-713, 21-23 Oct. 2011. Baumgartner, B., et al. "Performance of forward error correction for IEEE 802.16 e." 10th International OFDM Workshop (InOWo). 2005. The parity-check matrix, H, is a matrix where n is the length of the code, and m is the number of parity bits. The length of the code, n, is 672. The number of parity bits, m, is a function of the code rate. The IEEE 802.11ad LDPC codes are quasi-cyclic with sub-matrices dimension of 42x42. The 802.11ad LDPC codes are irregular. Appendix A Figure 1 shows the H matrix for the four code rates. The parity-check matrix, H, is a matrix where n is the length of the code, and m is the number of parity bits. The length of the code, n, is 576. The number of parity bits, m, is a function of the code rate. The IEEE 802.16 LDPC codes are quasi-cyclic with sub-matrices dimension of 24x24. The 802.16 LDPC codes are also irregular. Appendix B Figure 1 shows the H matrix for a select code rates.